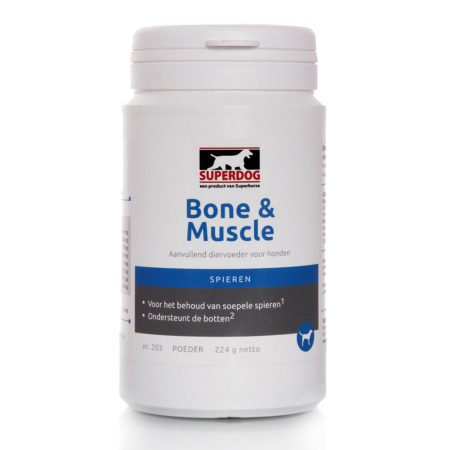 Bone & Muscle Dog contains a balanced mix of minerals, vitamins and amino acids. Of these ingredients vitamin D3 is of great importance to keep the muscles supple and to promote bone strength. The minerals calcium, magnesium and zinc support also support bone strength and bone density. Bone & Muscle Dog is very suitable for young, growing dogs as well as older dogs. It is also appropriate for show dogs and dogs that take part in competitions, for example greyhounds that partake in greyhound running competitions. Bone & Muscle Dog contains a balanced mix of minerals, vitamins and amino acids. Of these ingredients vitamin D3 is of great importance to keep the muscles supple and to promote bone strength. The minerals calcium, magnesium and zinc support also support bone strength and bone density. Magnesium is also important for the suppleness and activity of the muscles. Next to these vitamins and minerals, Bone & Muscle Dog contains more vitamins that support the muscles and bone strength. Vitamin B6 contributes to the energy supply to the muscles and vitamins D and K2 help develop stronger bones. Vitamine D maintains the calcium rate in in the blood and vitamin K2 works together with calcium to support the bones. The strength of dogs’ muscles does not merely depend on minerals and vitamins, it also depends on the amount and quality of protein used dog food. Bone & Muscle Dog is very suitable for young, growing dogs as well as older dogs. It is also appropriate for show dogs and dogs that take part in competitions, for example greyhounds that partake in greyhound running competitions. Are you looking for horse food with similar qualities? Take a look at our Muscle Impulse horse food. This product helps maintain supple and strong muscles and supports muscle recovery during and after physical exercise. Or take a look at our Bone & Joint Impulse. This food ensures the suppleness and maintenance of the joints and supports bone strength. A nutrition supplement is an addition to regular nutrition and is intended to replenish a deficiency in specific nutrients. A nutrient deficiency can arise by both insufficient nutrition and a higher need for a specific nutrient. It is not always obvious which supplement suits your horse’s needs best. A specific indication of the horse’s needs makes the choice for a proper supplement easier. We at Superhorse like to give advice on how to keep your horse in the best physical and healthy shape and how to properly add supplements to the horse’s nutrition, especially when your horse needs to perform at competitions. In order to draw the right conclusions and give you the best possible advice for your horse’s nutrition, we check the results of the blood test performed on the horse. Experience has taught us that even a more personal advice is often wanted and needed. Therefore, it is also possible for us to come over to your stable and discuss the different needs of your horse in person. This can also be done in groups. Widest selection and everything on stock. Please allow us to give you expert advice on our products. We will ship your products fast and secure.